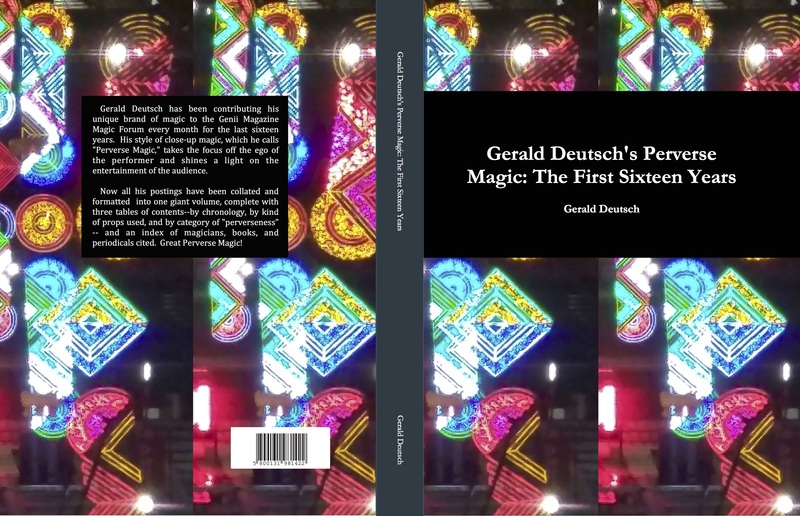 I’ve written here about Gerald Deutsch before, and I’ve even posted video here of me performing some of his magic, so I’m happy to report the publication this week of a beautiful hardcover 470+ page book chock full of Jerry Deutsch’s unique brand of magic called Gerald Deutsch’s Perverse Magic: The First Sixteen Years. Later in this post I’ll talk about the genesis of the book and my role in producing it, but first I’d like to explain a little more about what “Perverse Magic” is. Magic is a wonderful entertainment and sometimes art, but there is an aspect of it that can potentially turn audiences off. A performer says to an audience, in effect, “See how wonderful I am,” but a performer claiming such magical power risks getting into a power struggle with a certain kind of spectator. But Jerry’s style of magic, “Perverse Magic,” (the term is taken from an early magician, Charles Waller, who first mentioned this style of magic) eliminates this potential friction point between performer and audience. The magic happening is attributed not to the performer’s will, but to causes outside it. In other words, the magician appears to be just as baffled (Acting!) as the audience member is; in that way, the performer is on the same side of the spectator, rather than an antagonist. 1. Something just happens without the performer’s knowledge, and without the performer wanting it to happen. You can see this in the magic of Cardini, where cards and cigarettes appear in his hands out of his control. 2. The performer expects one kind of outcome, but something else happens instead. For example, the magician says he will make a selected card penetrate a handkerchief; instead, when the hankie is opened, the card face is blank and the hankie has a large size copy of the chosen card printed on the handkerchief. 3. The magician says he’s going to do something; but instead, that something happens by itself. For example, a rope suddenly unties itself. 4. The magician does something and is caught; but when he confesses, it’s not what the audience thought–nor what the magician thought either. For example, in an egg bag routine, the magician admits that he has been hiding a spare egg in his armpit. But when he lifts his arm to retrieve the egg, to the surprise of both the performer and audience, the egg has vanished. 5. The magician and the audience are on different planes as to what each sees. This is a whimsical approach: for example, a magician pays for some candy with a half-dollar that s/he offhandedly pulls from a pen cap. 6. The performer doesn’t understand why what happens, happens. For example, the performer fails to find the spectator’s card, even after several tries. In disgust, s/he throws the cards upwards–and to the performer’s, and the rest of the audience’s amazement, the spectator’s card sticks to the ceiling. It’s a great way to solve the ego problem in magic. Let me explain a bit on how this book came to be. For the past sixteen years, every single month Jerry Deutsch has been posting Perverse Magic effects to the Genii magic forum. Finally, a few months ago, Jerry brought an end to the wonderful series. Jerry’s posts instantly resonated with me–I had tinkered around with something I called “Accidental Magic” for a while, when I discovered that Jerry had been doing this for decades before. When I discovered Jerry’s Genii thread, I was enchanted. I looked forward every month to Jerry’s latest perverse entry on the Genii forum. I thought it would be nice to gather up all of Jerry’s posts and put them into book form so that I could study Perverse Magic more closely for my own personal use. I’m a book guy, that’s how I learn. So I began putting the book together, and as I progressed I thought, wouldn’t it be a great tribute to Jerry to release this to the general magic public? I didn’t want to step on anyone’s toes, so I asked Richard Kaufman, editor of Genii, what he thought, and he gave the project his approval. I asked Jerry, and he was happy to be getting a copy, but he preferred not to release it to the general magic public. 1) He deserves financial remuneration for his efforts. 2) For many people, book form is more convenient to learn from than a website. 3) Most importantly, Jerry’s landmark contributions to the art of magic in developing this unique form of magic should be documented, appreciated, and preserved in a more permanent way than the internet cloud. Jerry still demurred, even after I assured him that I wanted no remuneration for myself. I was disappointed, but I continued working on the book. When it was finally finished, having designed the book layout and cover, and copy-edited it, I sent Jerry a copy. A few days later I got a call from Jerry, who I had never spoken to on the phone before. He was really happy about the book, and wanted to release it to the general magic public with one important condition: that all proceeds would go to charity. I was so happy when he said this. It was the perfect solution! Jerry mentioned that he had done work volunteering in hospitals, doing magic for young patients, and that he would like to find a charity that would support that kind of work. FISM has been called the World Olympics of Magic. It’s not quite that, but it is an international competition where performers attempt to wow their fellow magicians. This year’s winner was the amazing Eric Chien who turns some common tropes of card and coin magic upside down and inside out. For me, he’s the most refreshing card man since Shin Lim. The world lost a wonderful magician this week. The above video is by no means Ricky Jay’s most baffling trick, but in some sense it is one of his most quintessential. Who else but Ricky Jay would think of pulling this off this way. A big thanks to everyone who participated in the contest. It was really enjoyable reading the entries. The assignment was to elucidate what you considered the three greatest tricks in Our Magic. The first-prize winner was Sean-Dylan Riedweg whose entry described exactly why he thought each of the three tricks he nominated were winners, and he also provided meticulous citations for each effect. Sean-Dylan chose Semi-Automatic Card Tricks Vol III by Steve Beam as his prize. The second-prize winner was Abe Carnow. Abe made a very strong case for a trick which most of us have in our drawers, but disdain to use during performance. Sometimes we forget how good some of the most common ideas in magic are. He chose Stewart James: The First Fifty Years as his prize. We advise Mr. Carnow to get into good physical shape with a few bench presses before attempting to lift that weighty tome. Third Prize went to Steven Go. Steven also advocated for a trick that most would consider very commonplace, but Steven provided a very wonderful description of the effect of the trick on his young daughter. He really brought to life what a special moment was created between the two of them because of that trick. He chose the DVD Time is Money by Asi Wind as his prize. And finally Honorable Mention to Steven Bryant for his incredible poetic entry, which was part of an even larger Magic Castle New Year’s magical poetic ode. Thanks again to all who entered. Sometime next week, everyone who participated will receive a pdf compilation of all the entries that were sent in. Okay, rest up and if there’s enough demand, we’ll do this again next year. Yes, it’s time once again for this blog’s annual World Famous Magic Contest (“World Famous,” as in my local restaurant’s “Sam’s World-Famous pastrami-on-rye sandwich, one trip to the salad bar only, please”). Last year at a magic Convention I overheard the tail end of a conversation where a well-respected famous magician was saying to his companions, “Well, that’s because that’s the Greatest Trick in Magic…” I kept on eavesdropping, but I never heard just what that earth-shaking Greatest Trick in Magic was. So your mission, Jim and Cinnamon, if you should choose to accept it, is to tell us what the three greatest tricks are in magic. But please don’t just list them. You must explain why you consider each trick a great one. Extra points for coherence, unexpectedness, humor, and persuasiveness. First prize is first choice from the terrific grab bag of wonderful magic books, tricks, and DVDs I’ve put together; second prize is second choice from the grab bag; and third prize, in a parallel, numerically pleasing manner, is third choice from the grab bag. The items in the grab bag are all commercial books, tricks, or DVDs, at least one of which, I guarantee, you will be very happy to own. And in the spirit of everyone being a winner, I’ll also ask all entrants to allow me to make up a pdf file which includes their entry. This pdf will not be sold, but will be offered only as a free download to all those who enter. Deadline Wednesday, Oct 31, 11:59 PM. All are eligible except those who have won 1st, 2nd, or 3rd prize in the previous two years. In a pre-cursor to his great Flydini routine, Steve Martin performs this humorous sketch, a spoof of a Channing Pollock-like magician, on a Johnny Carson Comedians Special. Wonderfully soothing and endlessly fascinating, these hyper-realistic motion graphics from Swedish designer Andreas Wannerstedt are hypnotically engaging. IN 1955, Orson Welles did a series for BBC television, telling tales based on his sketchbooks. This was one of Welles’s favorite magic stories. If Lenny Bruce were a magician, he would be Steve Spill. Lenny has long since passed onto that great big comedy stage in the sky, but fortunately our friend Steve Spill is alive and well and has come out with a new book aimed at magicians called How To Make Love The Steve Spill Way. His first book, I Lie For Money, was aimed at a general audience and contained lots of advice on how to live a creative life. It was served along with large dollops of autobiography and spit-take funny stories about the people he met along the path while building an artistic life for himself. In this new book, Steve not only continues his general advice for would-be artists, but also gives up the details of a dozen of his most creative and hilarious tricks. It would be an understatement to say that I think everyone interested in performing magic should read this book. It’s always a great gift when a wonderful performer tips the secrets of his act, but it’s an even greater gift when the performer himself does the literate and humorous writing chore. Because it’s in that act of writing that Spill divulges his biggest secret: the most powerful thing a performer can do is to find her or his own quirkiness and unique qualities and put them out on display in a performance-oriented way. When you read one of Spill’s books, you instantly understand what he’s talking about when he says to trust your own personality, because the pages of his books are drenched in the unique persona which he has nurtured. While on the one hand it’s instructive to pick up a Dai Vernon book written by someone like Lewis Ganson, on the other hand, the fact that Ganson, not Vernon, wrote it deprives the reader of real insight into much of Vernon’s personality. With a writer like Steve, though, it’s all hanging out there, and it’s plain as day. You understand immediately that the twelve killer presentations that Spill has detailed are perfect for Spill. Those who are not Steve would most likely fall on their faces if they did his presentations verbatim, but that’s not the point. The point is…who are you? There are so many lessons to be learned here, not the least of which is the courage of one’s convictions. I read the beginning chapters twice, because the first time through I was laughing too much at the jokes to pay attention to the content. But if you’ve got as warped and crazy a mind as Steve does (that’s a compliment, I think) there are bound to be doubts about whether anyone else will appreciate what you’re doing. However, Steve’s examples of himself being true to form, along with his constant brainstorming, testing, discarding, and revising of effects, serve as a model of what can be done, and act as a spur to one’s own creativity. For each of the twelve effects Spill describes, he gives the background story on how and why he created it, and these stories are useful adjuncts to understanding how to create your own effects. The methods are tried and true, and for the most part they probably won’t surprise you with their cleverness after the fact. But that’s not what Steve is after—what will surprise and delight you is the way that Steve takes an effect from column A and a presentation from column Z, and juxtaposes them to create something never seen before, something to amuse and mystify an audience, which leaves them with the impression of a strong magical personality and experience. What’s in the tricks section? Well it’s a compilation of Spill’s greatest hits—The Lemon thing, the Needle thing, The Himber Ring thing, the drug and hemorrhoid jokes, they’re all there, with full scripts and extra handling and performance tips explained with loving care. The most audacious routine is one called “Abra Cadavers” which involves, well, a tale of cadavers wrapped in a personal story of tragedy. You would have to be nuts to perform it. I’m happy to report that Spill has done it many times, and tells you how to do it so that you too can be the object of abject speechless horror. I also thought that the presentation given for the UltraMental Deck was one of the best ideas for it I’ve ever come across. At the end of the nineteenth century, the British magician David Devant expressed his appreciation of his audience with the tagline, “All Done By Kindness.” Likewise, Devant’s American contemporary, Howard Thurston, would prepare to go onstage by intoning in the wings to an imaginary audience, “Thank you, thank you for coming to my show tonight. God Bless You.” And now in the same spirit, as we navigate the twenty-first century, Steve Spill urges us to make love The Steve Spill Way. His love for magic, his love for his audiences and for his unique self are all part and parcel of How to Make Love The Steve Spill Way. A man sees the great virtuoso cello player Pablo Casals crossing the street. The man, so thrilled to get a glimpse of his artistic idol, dashes across the street and manages to catch up with Casals. Shin Lim’s card magic raises the bar for everyone. It’s rare that card magic looks and feels magical, rather than just an intriguing puzzle or demonstration of skill. Shin Lim’s performances give me that feeling of wonder. 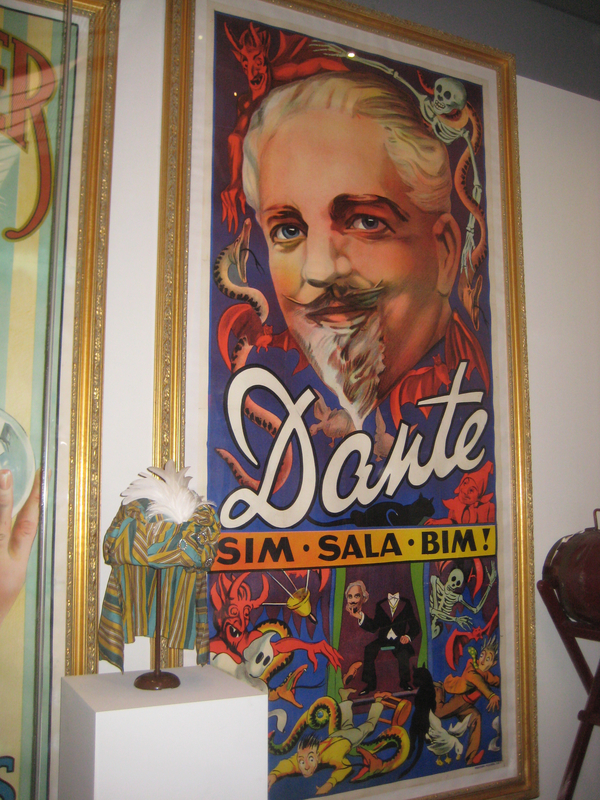 The New-York Historical Society recently opened a small exhibition on the history of magic in New York, drawn from the vast private David Copperfield Collection. An unannounced surprise at the opening was the presence of Copperfield himself, who gave us a short guided tour of the exhibit (as Homer Liwag toiled in the background, putting last minute touches on the exhibit). You can listen to Copperfield’s commentary, as broadcast yesterday on the Arts Express radio program on WBAI 99.5 FM, by clicking on the grey triangle above.